A bicyclist recently suffered serious head trauma after coming into contact with the open door of a parked vehicle in Brentwood, according to bikinginla.com. The 37-year-old cyclist was traveling on a two-lane street when the driver of a parked vehicle opened his door just as the cyclist passed. 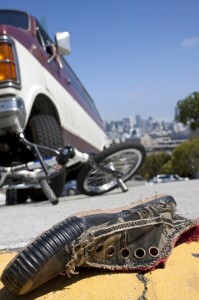 The cyclist fell head first from his bicycle and was taken to the hospital where he underwent surgery for head trauma. One of the first responders at the scene, Brentwood Senior Lead Officer Maria Gray, said that the biker was not wearing a helmet at the time, although he was using a headlamp and tail light to make himself visible while riding at 6:46 pm in the evening. At the time of reporting, the biker was still in critical condition. While bicyclists are advised to stay clear of the “door zone,” bikers may ride in the street on narrow roads to avoid “dooring” accidents. However, motorists are responsible for exercising caution when opening the door of a vehicle on the side available to moving traffic and may be held accountable in the event of a collision (CVC 22517). It is unfortunate that even slow-speed accidents can have tragic consequences. If you or a loved one has been injured by a negligent driver in a bicycle crash, please do not hesitate to take legal action to protect your rights. LA County bike accident Lawyer Joseph H. Low IV has the experience and resources to help injured victims or surviving family members recover financial compensation for their losses. Contact us online or call (888) 454-5569 for a free consultation.